(CNN) -- Rafael Nadal breezed into the last 32 of the French Open with a straight sets 6-1 6-4 6-2 win over Teimuraz Gabashvili of Russia on Wednesday. Perfect in pink. 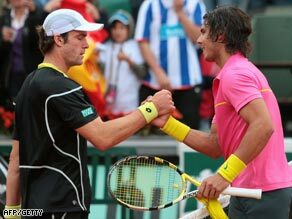 Nadal shakes hands with Gabashvili after his easy win. It was a routine victory for the top-seeded Spaniard who was securing his 30th straight win at Roland Garros and is bidding for a record fifth straight French Open crown. Nadal was only troubled in the first game of the match on the Suzanne Lenglen show court, saving three break points title his fifth straight has never lost at Roland Garros, and his 30th straight win on the tournament's red clay gives him the record for most consecutive wins. Nadal was forced to save three break points in the first game of the match but went on to dominate the set. Gabashivili hung in the second set to 4-4 until being broken by the relentless Nadal in the ninth game before the world number one took a two sets to love lead. The decider was a mere formality as Nadal won in two hours 17 minutes to earn a third round match against former world number one Lleyton Hewitt of Australia who beat Adrey Golubev of Kazakhstan 6-4 6-3 6-1. Earlier, world number three Andy Murray shrugged off the loss of the second set to beat Potito Starace of Italy 6-3 2-6 7-5 6-4. Murray trailed 5-1 in the third set and looked headed for an early exit until winning 11 of the next 13 games. "I left a lot of balls in the middle of the court. I was playing further behind the baseline," admitted the Scot. "But the most important thing is I found a way to win and I'm very happy to be in the next round," he said. He will next play Janko Tipsarevic of Serbia who upset 28th seed Feliciano Lopez of Spain 6-7 6-4 7-6 6-3. But former world number one Marat Safin of Russia went out in a five-set marathon to home player Josselin Ouanna. He beat the 20th seed 7-6 7-6 4-6 3-6 10-8. Safin was playing in his final French Open after saying he will retire at the end of the season.